The Lumaline Advertiser Counters are an addition to our well-known regular counters. They are now available in a cost-effective version for backlit film (roll-to-roll). The counters are extremely versatile and will fit almost any location – the backlit nature of the system guarantees impressive attention to your message. The counters consist of a white polycarbonate plate attached to two modular frames and comes with a lightweight tabletop, shelves and bags. Inside energy saving light bulbs make the table light up. The tabletop is also available in black. An opaque film with print is mounted with Velcro. 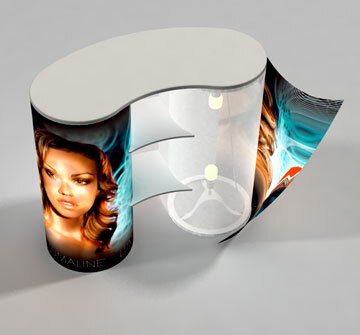 The Advertiser Counter is available in Counter Small, Counter Large, Meeting Table and Conference Table. Media: Transparent or opaque film mounted with female velcro.